“I get by with a little help from my friends”. 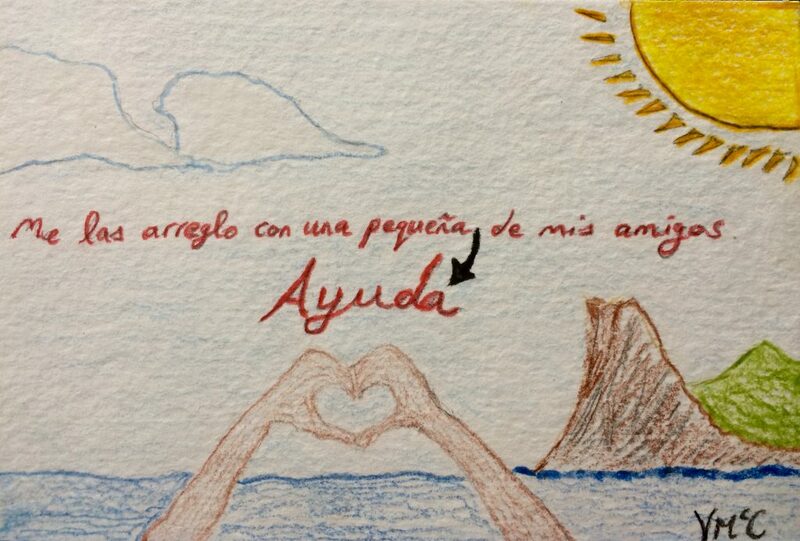 My attempt at art to say gracias for help I received from my Spanish teacher. Hola mis amigos, la vida es buena aquí en Guatemala. I’ve been living in Xela for just over two months now. My Spanish is improving every day and I’m finding new ways of becoming immersed in the city. 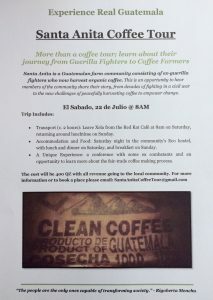 I have tried to make a difference by leading a new project, a weekend coffee tour to Santa Anita, a community of ex Guerrillas who now harvest organic coffee. I have also continued to pursue my quest to learn more about impact investing, recently meeting with a local impact investment firm called Alterna Impact. 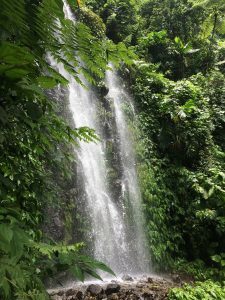 As I may have conveyed in my previous blog I had been on a serious run of good luck – in terms of how everything has just fallen into place for me – so it was about time things took a brief pause. A couple of weeks ago I had to spend a night in hospital after surgery on a fractured finger, an injury I picked up in a soccer match. I know an injured finger doesn’t sound like much but it is more the general experience. Still, I was blessed to have my Spanish teacher Dora help me through it. Despite the odd speed bump life is good here in Xela. In some ways it is hard to believe how settled I feel here in such a short space of time. The Friday before last I threw my first barbeque on my terrace overlooking Xela and the surrounding mountains; half the group were other foreigners and the other half were locals but the conversation was in Spanish. 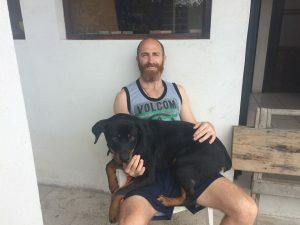 I think that progress makes me feel more connected to Xela and feeds a desire to stay here and follow through on my goal to become fluent in Spanish. Shortly after arriving in Xela I reached out to a guy by the name of Willy Barreno, an ex-guerrilla fighter who is now fighting to create what he calls “The Guatemalan Dream”, a viable alternative for locals who, starved of opportunity at home, are forced to make the treacherous journey north in pursuit of the so-called American dream. Willy learned first-hand the illusiveness of the American dream during his own 12 years working in the US and the challenges facing Guatemalan emigrants. Inspired by a fellow Guatemalan, also disillusioned with life as an emigrant, Willy co-founded DESGUA (see link), an organisation focused on ‘creating economic and educational development with and for returned migrants and Mayan communities in Guatemala”. He also runs La Red Kat in Xela, “a social enterprise restaurant and cultural centre”, a haven for Mayans to regain their identity but also importantly a place for connecting people and for the exchange of ideas and information to flourish. Willy likes to challenge the traditional notion of simply money as medium of exchange. ‘We’re making a trade right now. Every interaction is an exchange and we can learn from each other in this trade of information’ I remember him saying to me the first time we met as he pondered how random it was for us to be even sitting in La Red having the conversation. His philosophical wanderings steeped in Mayan learnings made me want to hear more but it was the conviction he conveyed for actually bringing about change which really peaked my interest. More than a coffee tour! Discussing the history of Guatemala Willy recommended I watch a documentary he helped make called “Voice of a Mountain – Life after the 36 Year War in Guatemala” (See link to documentary). 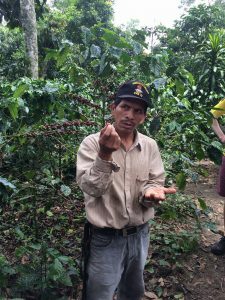 After learning about Santa Anita, a Guatemalan farm community consisting of ex-guerrilla fighters who now harvest organic coffee, we discussed the idea of setting up a coffee tour as a way for others to learn the history, while also helping out the community. Jumping right in I designed a flyer for a mid-week showing of the Voice of a Mountain documentary, which we used to generate interest among the Spanish students in Xela. We had more than 20 at the first showing. I followed this up with a flyer for the tour to Santa Anita and set up a Facebook page @SantaAnitaCoffeeTour. With the help of a recent graduate who is interning at DESGUA we successfully ran our first tour to Santa Anita the weekend before last with a group of 10 people. The scenery, the people and the history make it so much more than just a coffee tour. It felt great to have been part of actually making the weekend possible, with a truly engaged group of people. What started out as an exchange of information with Willy Barreno culminated in a memorable weekend in Santa Anita, what I hope will be the first of many more tours that we run to Santa Anita. It is a great way for foreigners visiting to learn more about the history of Guatemala and the 36 year war from a community of people that was at the heart of the struggle. Of course, the wounds are still fresh and it not easy for these people to open up. We get a glimpse into their lives but these people carry the emotional burden that comes with fighting a war. I was reminded of this on our bus journey back to Xela, joined by an ex-guerrilla fighter named Gonzalo. He was a nice man but he had the edginess of a guy that is always looking over his shoulder, his eyes darting every so often to some minor activity outside the bus. I suppose it is normal given that he joined the guerrillas at 14 and spent 17 years fighting. As we got chatting he noticed my two friends seated beside me, identical twins. Gemelos (twins) he asked, before recounting the story of how his twin, also a guerrilla fighter, was killed at 17 in a battle with the Guatemalan army. We get to hear the stories of their past but these people have to suffer through the memories. They will likely never recover fully from the psychological impact of war but maybe in some way talking about it might help. The fracture, less gruesome than the after pics! Not for the first time, I ended up in a foreign hospital. This time for surgery on a fractured finger I incurred playing soccer. My Spanish lesson this particular morning involved my teacher bringing me to the hospital. I didn’t expect to be spending the night! 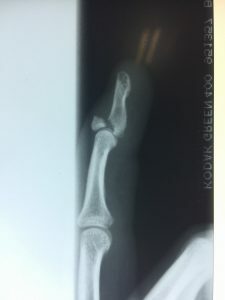 The doctor explained that it was a displaced fracture which required surgery or my finger would be effectively deformed once the inflammation went down within a few weeks. That would be the end of my guitar playing career before it even got started. So I followed the doctor’s advice. Four or five hours later I was on the surgery table with an anaesthesiologist giving me the heads up that it was lights out time. “Vas a dormir ahora” and when I came around I was out of it. I remember asking when they were going to start and it was a bit of a shock to see a pin sticking out of my finger. Then they had me in a wheelchair getting more X-rays before being brought back to my bed. Not long later they were wheeling me back down because the pin was too big and there was no circulation on my finger. I was wheeled into the X-ray room with an actual drill on the table that they needed to use. I don’t know what they did. There was the sound of a drill and blood so I looked away! It was a fairly strange hospital experience and bit of a blur. I don’t like hospitals, they fill me with anxiety even I when I am just visiting. I don’t know if there is any other place that provokes as much thought and reflection in me. Lying in bed hungry (the operation was under full anaesthesia which meant I couldn’t eat) and tired waiting for my surgery, with plenty of time to think, I was reminded of my dengue fever hospital experience in Malaysia in 2012 and my mind wandered along the path of life that has played out since. Five years I think to myself. I doubt the Vincent of over five years ago could have envisaged he would now be living in Guatemala having conversations in Spanish. A lot has happened since then. What would I change I wonder? There are a few things I would probably do differently but I wouldn’t change where I am now and the adventure I have embarked on. The one thing hospitals can be good for is to remind people to live in the present and enjoy it. It is a shame that it takes a health scare for some people to fully appreciate life now (I am talking about more serious ailments than a fractured finger of course). 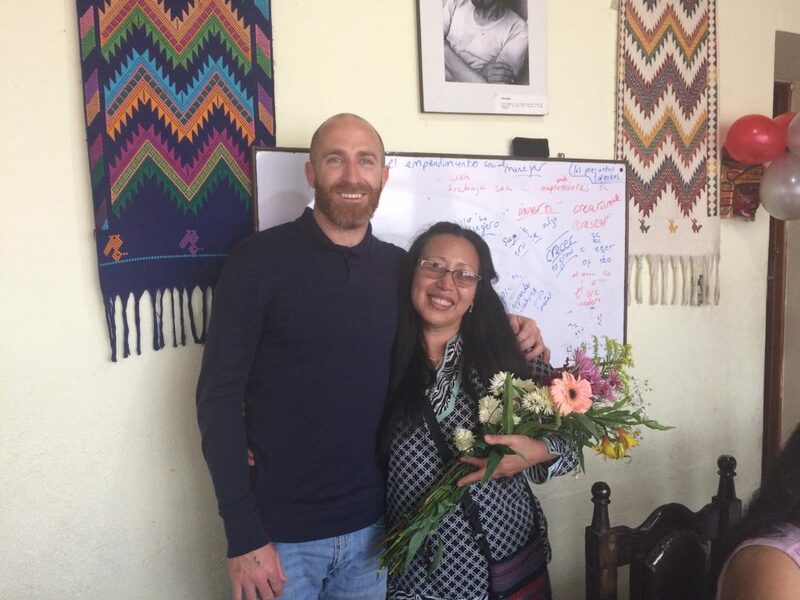 Last week I met with Tyler Hollenbeck, the Guatemala Country Manager for Alterna Impact, an impact investment firm founded here in Xela in 2010, “committed to developing the next generation of dynamic social entrepreneurs in Guatemala and beyond”. In my last blog I noted my scepticism about the motives of impact investment and how they balance the traditional return objective underlying any investment with their social impact objectives. So I was keen to meet with Alterna and learn more about how they work with entrepreneurs. It turned out to be a very fruitful meeting. As I expected, “Impact Investing” is a wide encompassing category of investment and the philosophy and objectives of each impact company can be dramatically different. The balance each firm strikes between the profit motive and the social impact motive will also vary dramatically. Alterna are much more what I had envisaged an impact investment firm being. Since it was founded in 2010 Alterna have worked with over 800 entrepreneurs and the company now has 36 employees, many of whom are hired under their fellowship program, ‘a program which has helped them bring top talent from the most innovative firms, universities and organizations worldwide’. Santa Anita: amazing waterfalls on our hike. While the incubator model of investment focuses on helping to build potential stars the accelerator stage is more focused on bringing star companies to the next level. However, where Alterna see a major gap is helping those companies that can grow from two employees to ten employees and be a meaningful driver of economic growth with a positive social impact. While these companies may never become a big global company they are the companies that play a significant role in the development of communities and the domestic economy. At a family office conference (a family office is an investment group serving wealth families) recently held by the Family Office Club in the US one of the key takeaways was the interest in impact investment expressed by many family offices. “One family office spoke at length about sustainability and impact investing, which served as a reminder that family offices (and the families that they represent) are increasingly looking for a “triple bottom line” or some measurement of positive impact when it comes to their investments”. However, the Family Office Club did note that there was also a scepticism expressed about what was really an impact investment, exacerbated by the fact traditional investments are being sold as impact investments by an adaptive financial services sector aware of the growing appeal of socially responsible investing. Yet, even when they are sure an investment meets their “impact” criteria investors still find it difficult to move away from a mandate focused on return maximisation. “Even in the cases where a manager or a company is presenting a true impact investment, there is some resistance among investors who see achieving a social impact as a low priority compared to their duty to generate high returns.” Therefore, the future of impact investment will be shaped as much by the stewards of capital and their priorities as the firms at the forefront of this growing investment category. The requirements set by the funding sources employed by an impact investment firm will to a large extent dictate the nature of the types of investments they can make. The more aggressive impact investment firms – in terms of pursuing return – will likely be able to attract more capital in the short term to invest but it may result in their investment universe being constrained and force them to compromise on their social impact objective. Still, if less aggressive impact investment firms – those that can strike a more equitable balance between generating return and delivering a social impact – can successfully deploy capital to deliver reasonable returns that are sustainable they may be better placed longer term to benefit from a trend towards more socially responsive investing. A high success rate means lower default rates which in turn will factor into the interest rates an impact investment firm will have to charge the underlying companies. Of course, a “reasonable return” is very subjective. I could write more on this but I’ll leave it for another day. The more I learn about impact investing the more it appeals to me as an area I might work in some day. “Si hay confusión existe la duda, si existe la duda hay comprensión y tu avanzara en la vida” (If there is confusion there is doubt, if there is doubt there is understanding and you will advance in life) – Wise words from my Spanish teacher Dora. 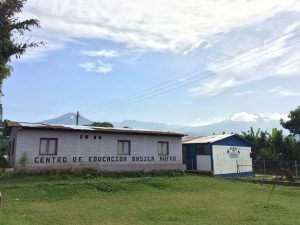 I have now completed 10 weeks of Spanish immersion here in Guatemala. The first three weeks I was in a school and over the last seven weeks I have been taking private lessons every morning with a great teacher by the name of Dora. I think the school was good to get started and it was also a way of meeting people but I like my routine now where I do a bit in the morning and then get two quality hours of lessons in with my teacher. In the evenings I can make use of other things like Netflix, podcasts, books and even lessons on YouTube to change up my learning. I have to give Dora a special mention in my blog because she has really helped me with my Spanish and she has really looked after me here. She has a natural enthusiasm and passion for teaching which is infectious and I have really enjoyed my classes. She is not the type that is watching the clock either, we often run over. The time flies by and I always leave her house with a positive feeling about how my Spanish is progressing and a determination to reach full fluency. As well as being a great teacher Dora is a genuinely kind person; at times I feel more like her adopted son. I was blown away by how much she went out of her way to help me through the hospital experience. My teacher Dora, at her surprise birthday party this weekend. A great person. Since my classes are at her house I have got to know the rest of her family too, her husband Frank, her grown up kids, her mother and even her aunt lives with them. This is common in Guatemala and I have to admire their patience living in such close quarters. It is usually Dora’s elderly aunt or mother that lets me in every morning and they are so nice. Her mother is battling cancer and while the physical side effects of the treatment are noticeable you can tell she is a fighter. She still has her smile. Dora’s aunt was the youngest in a big family and it was a custom the youngest had to stay at home and serve her parents so she spent most of her life looking after her father. She didn’t get to go school and never even had a boyfriend. So Dora said her aunt is amazed by me being there and speaking Spanish. Hearing things like that are a reminder of the privilege of being able to pursue this adventure. Soy un hombre con mucha suerte.